Last week was my birthday, and I unexpectedly got a gift in the mail from my cousin. We don’t normally exchange birthday gifts, but she came across a t-shirt called “Tubes of Mars” and just had to buy it for me. Apparently, this line of shirts is capitalizing on various wacky conspiracy theories and they decided to use one of my favorites, the “glass tubes on Mars” idea. Photographs taken from Martian orbit reveal what appear to be miles and miles of ribbed ‘tubes’ on the surface of the red planet. It is estimated that these tubes have diameters of close to 600 feet. Some have tried to explain these formations as a the result of geological processes. Others believe they are organic in nature. Yet some are convinced the tubes may have been constructed. If you’re not familiar with this hoax, let me explain, starting with a picture. 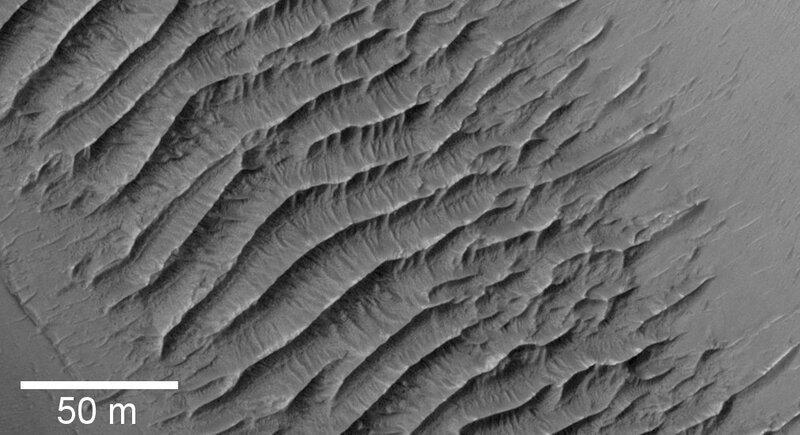 Here's a HiRISE view of some channels on Mars full of aeolian ripples. You can see here that the larger ripples break up into more complicated ripples toward the edges, and that there is a secondary wind direction forming small ripples perpendicular to the big ones. I’ve always found the belief that these features are some sort of glass tubes on Mars to be both funny and sad at the same time. It shows a complete lack of understanding of the very interesting geology at work on Mars (and Earth), along with a somewhat disturbing willingness to see evidence of outlandish claims and conspiracies everywhere. Those of us in Mars science are all too familiar with this. 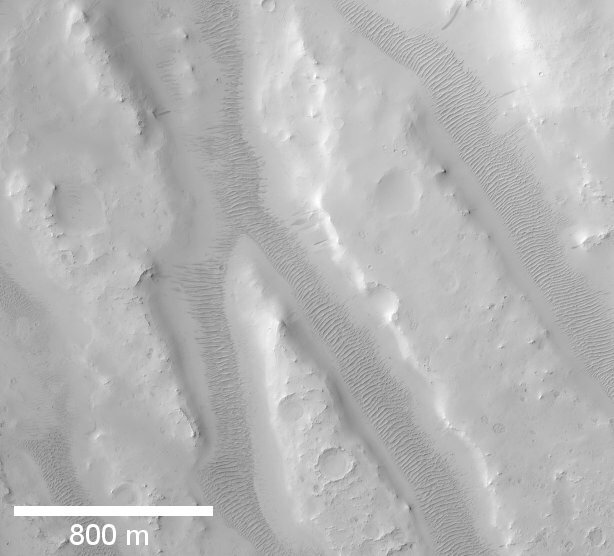 There’s a long tradition of seeing what you want to see on Mars, going all the way back to the famous “canals”. These days, no scientists really think there’s macroscopic evidence of life on Mars, but I think there is still a very strong desire among scientists and the public for early Mars to have been “warm and wet” (a.k.a. Earth-like). Maybe it really was earth-like, but maybe it wasn’t. We all need to be vigilant and make sure the way we want Mars to be doesn’t cloud our conclusions. This entry was posted on October 27, 2010 at 8:12 am and is filed under Skepticism. You can subscribe via RSS 2.0 feed to this post's comments. Both comments and pings are currently closed. Very cool article. There is nothing like a conspiracy theory to fuel all kinds of outlandish speculation. Good photos.